Home → Blog → WordPress → How Many Columns Does Your WordPress Site Need? How Many Columns Does Your WordPress Site Need? When it comes time to choose a page layout for your WordPress site, there are many things you should consider. One such consideration is the number of columns that your site should have. WordPress themes can be laid out in any of these layouts depending on the theme designer’s preferences, the purpose for creating the theme, and the expectations and needs of WordPress developers and website owners. When choosing a layout design for your WordPress site, it’s best to keep in mind the needs of your readers and the ultimate goal of your website. For the most part, these column formats are a holdover from the print days when newspapers and magazines chose the best layout for their readers and editors. Each format has its advantages and disadvantages. One-column format: Online, your reader has the benefit of clicking a link and heading off to another page. There may be times when you want to limit that ability. The one-column format is perfect for this use, especially if you have a product or service for sale and you want to limit the distractions to keep your reader focused on your sales message. Two-column format: You’ll typically find blogs using this format with a main column for the blog posts and a sidebar for links, categories, tag clouds, maybe some advertising, and other graphics that quite often get ignored. The sidebar is a necessary element many times for navigation or to offer a reader a simple, convenient way to find information on your website. It can serve as a useful element on any website or blog. Three-column themes: Somewhat more rare than the two-column format, three column themes most often make use of a main container for your website’s or blog’s primary page content. The sidebars are used for navigational and informational purposes to help your readers find information more quickly. They’re especially helpful for large websites with a lot of pages across many categories, like e-commerce websites. Three-column formats are also quite often used for magazine-type websites where there are multiple categories and several advertisers competing for the eyeballs of a lot of visitors. When it comes to choosing the right theme for your WordPress website, consider the needs of your reader. It’s possible that you’ll need a different format for different types of pages on your website. If that is the case, you’re better off going with a theme that allows you to change page formats based on the type of page you are creating on your site. A premium theme might be more suitable for those needs. Many free off-the-shelf themes are too basic for meeting the needs of dynamic publishers. If you are designing a small website that will follow the same format from page to page with little variation, you might find a free template to work with. Start with WordPress’s free template library or consult ManageWP’s Free Themes of the Month post series. While you can customize free themes, sometimes it is better to shell out a few dollars and get a theme that meets your needs without too much code tweaking. In that case, the following theme developers have created some nice themes in each of the popular column formats, and they’re affordable for any budget. Even better, you could check out our web design services! Let’s face it – sometimes even premium themes aren’t quite up to snuff. While the aforementioned premium themes are good enough for most website designers, there are times when only a Cadillac or a Lexus provides the most necessary features for your driving needs. By the same token, your website may need those extra features. If you find yourself creating landing pages for information products or building websites with multiple page formats, a premium theme with expanded licensure could be more up your alley. Theme developers like DIY Themes and StudioPress – makers of Thesis and Genesis, respectively – create frameworks with increased functionality that allow you to quickly change page layouts and add extra features to single pages more easily. These features are top of the line and you will pay for them. 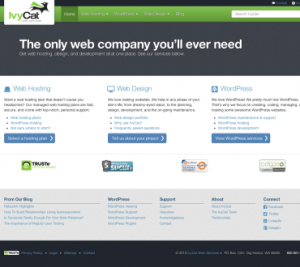 Still, they are worth it if you want a superior website that is beautiful and easy to manage. The benefit to themes like Genesis and Thesis is that you can design your website to look the way you want it to look and choose a one-column, two-column, or three-column format for each page on your website with one click, depending on the purpose of that page and the needs of your audience. When choosing a column layout for your website or blog, start with the purpose of the site and the specific purpose for the page on that website. Many times, your layout will be determined directly by that purpose. Secondarily, consider the needs of your readers. Always choose the layout that will most easily make your website more navigable and the information on your site easier to find without making your pages look cluttered. Leave a comment and let us know which column layout you prefer…and why!